The first time Malcolm Tubb met Sean, he was delivering him a food parcel on the riverbanks. In a follow up visit, Sean mentioned to Malcolm – who works with Combined Churches of Renmark Care and attends the Lutheran Church – that he had been hassled by some drug-dealers and wanted to move on from the area. Then, on Australia Day in 2018, Malcolm received a call from the local police. After they had stopped Sean to charge him for driving an unregistered vehicle, the police discovered that he had outstanding warrants in Victoria. “At that stage, he was really concerned – alarmed,” Malcolm said. Sean was taken to Hopkins Correctional Centre in Ararat, Victoria, and ever since, Malcolm and his wife Kathleen (who works alongside him) have continued to write to Sean. “I wrote to him and quoted some Bible verses and suggested that he could find a lot of comfort and prayer in talking to God,” Malcolm recalls. Sean is now a Christian and Malcolm says the transformation has been remarkable. “Knowing what he was like then and what he (is) like now, the difference is absolutely mind-blowing. It’s a complete change,” Malcolm said. Malcolm and Kathleen have visited Sean in person twice and Sean recently asked whether he could call them ‘Nan and Pop’. “Our visits there have always been great,” Malcolm said. In his time at Ararat, Sean has started painting. 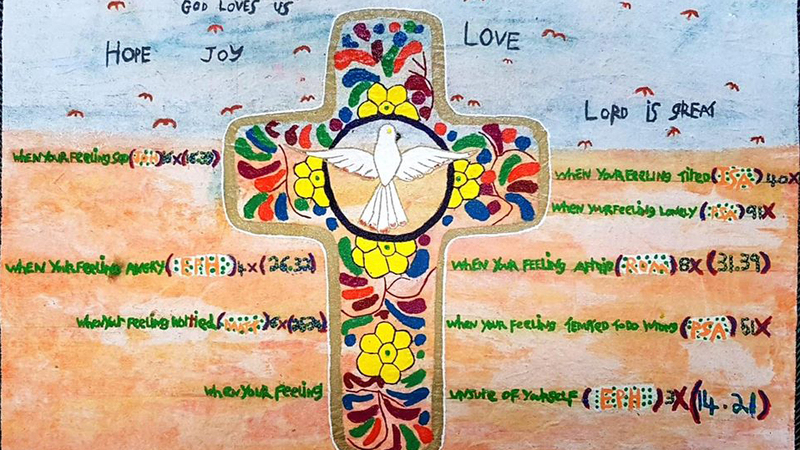 One of his paintings now hangs in the Renmark Paringa Lutheran Church. Another was gifted to Malcolm and Kathleen, while two others have been sold on his behalf. “He tells me now that he has another two paintings which he is finishing and he’s sending off to us,” Malcolm said. Malcolm says the support of the Renmark Paringa congregation has been “tremendous” and that they get regular updates on Sean’s progress. He mentions how one member of the congregation was moved to tears reading Sean’s most recent letter. Sean’s story is a great encouragement and example of the Holy Spirit working within our community through people such as Malcolm and Kathleen. “The fact that we were there in the right place at the right time, and Sean was prepared to listen to us, the police that arrested him was a policeman that we worked with on a regular basis … God’s presence was definitely evident,” Malcolm said.